The term “ultra-sensitive skin” might carry some odd connotations, as though scientists were trying to replicate the feeling of a patch of sunburned skin. However, when materials scientists hear that term, it’s an ultimate goal, a chance to improve the industrial world, and the lives of a great many disabled people, as well. Scientists have been making enormous breakthroughs in the control and mechanical abilities of prosthetic limbs, creating hands that can grasp and brain-machine interfaces that can receive and interpret ever-more nuanced input. However, once the beautifully articulated hand reaches out and perfectly grasps a glass of liquid in response to a thought from its owner, how hard should that owner grip down? Is the tea within iced, or scalding? The ability to give information to artificial limbs has far outstripped the ability of those limbs to give information to the user. Researchers from the Technion-Israel Institute of Technology have found that by incorporating gold nanoparticles into a substrate made of polyethylene terephthalate (PET), the plastic used in bottles of soft drinks, they were able to make an ultra-sensitive film that could help put an end to that disparity. The gold-polyester nanomaterial changes conductivity as it is bent, providing an extremely sensitive measure of physical force. 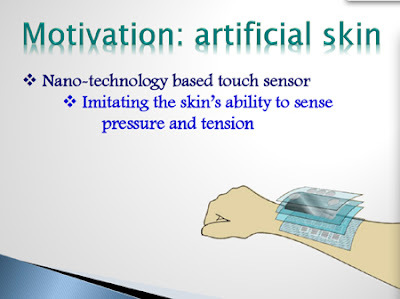 The films were shown to sense pressures between tens of milligrams and tens of grams — that’s ten times more sensitive than the most sensitive current sensors for artificial skin. And even better, the film maintained its sensory resolution after many “bending cycles.” Unlike many useful materials that can only really be used under laboratory conditions, this film can operate at very low voltages, meaning that it could be manufactured cheaply and actually be useful in real-world situations. 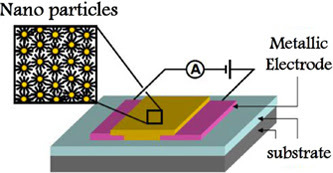 In technical terms, the sensors are monolayer-capped gold nanoparticles (MCNPs) which use radial organic ligands for protection and physical anchoring. In non-technical terms, as laid out by lead researcher Hossam Haick, they are “flowers, where the center of the flower is the gold or metal nanoparticle and the petals are the monolayer of organic ligands that generally protect it.” Either way, it’s a major breakthrough. Though only in an addendum to the main touch-focused body of the paper, the researchers do mention that by relying on the “superior characteristics” of these MCNPs they were able to make a prototype that could also sense temperature and humidity. The temperature resolution was also impressive, down to 1 degree Celsius with an error of just 5% — could the average human boast such fidelity? They achieved similar numbers for humidity, with an accuracy of 1% relative humidity and 9% error. Science fiction has long foretold artificial senses that outstrip natural ones, and this has very real potential in that direction. Assuming that the wearer won’t be constantly glancing up at a touch, temperature, and humidity readout on their Google Glasses, the major stumbling block will be interpretation of the signals by the brain. But with enough practice and calibration, and enough work to reverse-engineer the brain’s signaling, artificial skin could give amputees better temperature-sensitivity than they had before. At that point, these technologies could be attractive even to those without disabilities, making them augmentations rather than prosthetics. That’s the level of fidelity we’re facing, these days. Of course, this technology has applications outside of prosthetics, like highly sensitive and inexpensive stress detection for bridges, but artificial or augmented senses are certainly the most interesting. It does raise a question, however: Why go through all the effort of perfectly emulating natural human senses? When it’s all just digital information translated for the benefit of the brain, why not pursue sensing technologies that exceed the human capability — like temperature-sensing at range. 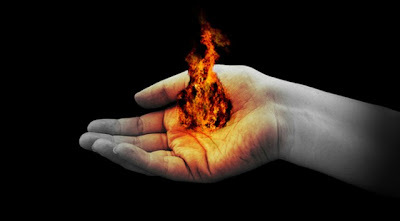 Imagine feeling the heat of an object from across the room. These sensing technologies are amazing, but might they just be a stop-gap that tides us over until we’re ready to progress beyond?